By Scott Gilfoid: Lennox Lewis sees little Derek Chisora (15-2, 9 KO’s) as having a chance at beating WBC heavyweight champion Vitali Klitschko (43-2, 40 KO’s) on February 18th in Munich, Germany. While few if any boxing fans and writers are giving Chisora any real chance of unseating the 6’7” Klitschko, Lewis thinks he might have what it takes to do it. When will these Brits ever learn? Chisora isn’t going to win; he has no chance whatsoever to win this fight and is going to be nothing but fodder for Vitali to toy with for a few rounds before putting Chisora out of his misery. Lewis also thought that David Haye would beat IBF/WBO heavyweight champion Wladimir Klitschko last July and we saw how well that went. Wladimir ended up humiliating Haye in front of the entire world. Lewis fought and beat Vitali by a 6th round stoppage way back in 2003. Lewis was getting all he could handle from Vitali when he was able to open up a huge cut over his left eye. The cut ended the fight, but at the time of the stoppage Vitali appeared to be on his way to victory. You can say that Chisora has a chance like in one of those lottery type odds of beating Vitali, but that’s about the best I can see it. 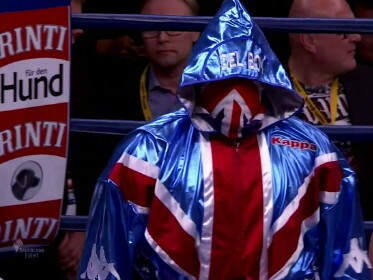 Maybe Chisora has a one in 200 million chance of winning. Yeah, you can say he’s got a chance but he really doesn’t in terms of real world possibilities. Vitali would have to have a major breakdown of a knee, joint, shoulder or hand injury for Chisora to win this fight. Otherwise, it’s just going to be a fight where Vitali smashes the #15 WBC ranked Chisora around the ring for kicks.